Soil amendment with humic acid is widely used to decrease the chemical fertilization rate on potato crop and other horticultural crops. In a recent paper by Dr. I. A. Abu-Zinada, decreasing rate of chemical fertilization on potato ( Solanum tuberosum L.) was achieved after humic acid application on soil. In the paper, Ab-Zinadashows how a humic acid at 20 kg per hectare on soil could significantly increase each of yield components as number of tubers plant-1 and tubers weight plant-1; tuber properties as tuber weight, tuber length and tuber wide; and vegetative growth of potato plant in term of plant fresh weight, plant height stems number and leaf area. Humic acid also has economical benefits to decrease inputs of field farming and amounts of applied fertilizers to 83-N+40-P2O5+ 40-k2O + 15M3 cattle manure per hectare.It is easily to be applied via drip-irrigation system without additional labor orfarming cost increase. Humateshumic acid andhumates are friends to environment. They are naturally released after organic manures deposit to lower soil acidity. This helps in converting the oxidized form of the elements in soil to the reduced ones. 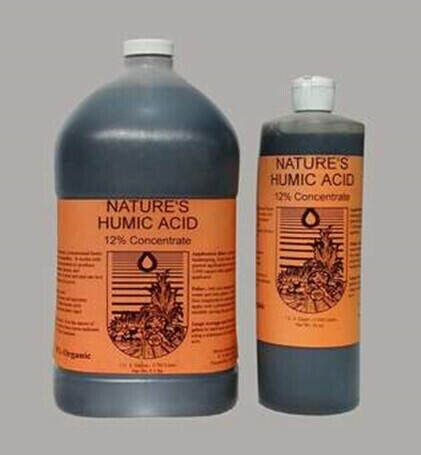 Humic acid is applied as a soil amending to lower pH of soil and helping plants to absorb macro and micro nutrients. These elements are constituents of different plant components or acts as a coenzyme.Humic substances are a heterogeneous mixture of naturally occurring organic materials that arise from the decay of natural residues. These materials contain carbon serving as a food source for soil organisms. These organisms break the chemical bonds in the residues as they digest the carbon. The remaining by-products serve as building blocks of humic substances. Humic substances in soil are commonly referred to as organic matter or humus. Humus is comprised of three distinct groups, namely: humic acid, fulvicacid, and humin. Increasing levels of soil humus has a number of potential benefits for plants: increased water and nutrient holding capacity ,increased reserve of slow release nutrients, enhanced solubility of phosphorus, zinc, iron, manganese, and copper, increased resistance to soil pH change and increased soil warmth, improved soil aggregation, decreased erosion, enlarged root system, increased stimulation of plant-growth due to hormones. Food safetyin potato could be obtained usingfriendly to environment products. Chemical fertilizers has hazardsto environment and food. They contain toxic pollutants of heavy metals. Decreasing rate of fertilizers and nitrogen applieddose is positively affecting to lower nitrate level in the underground water for domestic use. Nitrate is reduced to nitrite resulting in carcinogenic factors to human. 1- Dr. I. A. Abu-Zinada, 1Department of Plant Production & Protection, Faculty of Agriculture & Environment, Al-Azhar University-Gaza, Gaza Strip, Palestinian Territories. 2- K. S. Sekh-Eleid, Department of Plant Production & Protection, Faculty of Agriculture & Environment, Al-Azhar University-Gaza, Gaza Strip, Palestinian.